My sons Josh and Jesse Feldman are Arizona cowboys, gold miners, prospectors and treasure hunters. The new Travel Channel Series “Lost Gold“, premiering on January 14th follows the boys as they seek out Arizona’s most fabled missing treasures through legends and clues across the vast American Frontier. So, is there gold in them thar hills? The brothers sure hope so as they venture across the west in search of hidden treasures. The two history buffs not only hunt for lost lost and hidden mines, but travel back in time to uncover mysteries that are centuries old! “We have pulled the truth out of the legend, and we’ve pulled the truth from history,” adds Josh Feldman. “Only the truth will lead you to the treasure! The episodes delve into our family’s treasure hunting legacy and Arizona history as the boys unravel the mystery of Lost Adams Diggings – one of the most famous mines of the Southwest (with a new tip sending the brothers deep into the desert, the promise of gold is on the horizon). The brothers unravel more than 100-year-old mysteries from the shoes of the people of the era. The treasure hunt’s are rooted in history as they comb through the American frontier for old maps, diaries, records and speak to locals that behold key knowledge of the area. 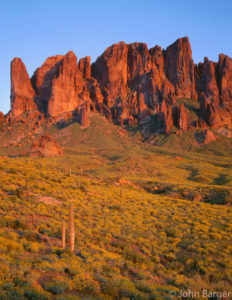 I invite our rock hound community to tune into the show for many reasons: family history steeped in lost mines, buried gold and Old West lore but also to discover our beloved Superstition Mountains. The mountain range where the boys grew up searching for gold with me is infamous for treasure hunting. 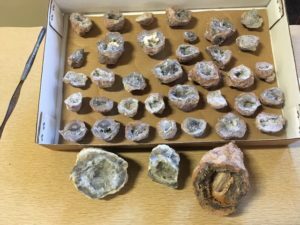 The land is full of gold and mystery including incredible geodes, whose location was revealed to me by a close friend (also, available for sale in the shop).